This fascinating account highlights the extent the world's major powers will go to as they seek to insure their own interests and agendas, despite the wishes of those whose countries they invade and occupy. 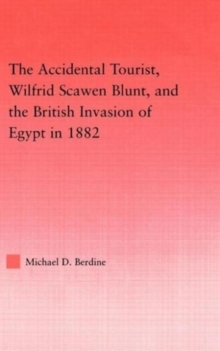 The Accidental Tourist profiles Wilfrid Scawen Blunt's involvement in the so-called Arabi Revolt in 1882. 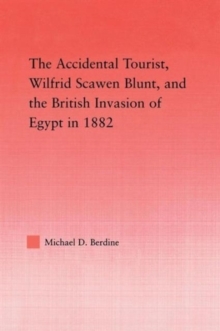 It addresses Blunt's tireless efforts on behalf of the Egyptian Nationalists to mediate the differences between Britain and Egypt and prevent a British invasion of Egypt. It highlights what amounted to a government cover-up of the actions of certain governmental officials to precipitate the invasion by falsifying intelligence information and manipulating the press. It also takes to task the scholarly tradition of maligning Blunt and questioning the accuracy of his version of the events of 1882. Blunt was branded a traitor in the House of Commons. This book was written to set the record straight. It is ideal reading for those interested in the field of Middle Eastern, Imperial or Colonial history and will provide readers with a better understanding of the real story of imperialism that went on at the time and is still going on in the Middle East today.